Summer has felt elusive this year, like New Year’s Eve in the way that New Year’s Eve so often feels anticlimactic, idealized and seldom as satisfying as we hoped it might be. It’s the middle of July, school starts again in 3 weeks, and I don’t feel like I’ve had a summer yet. On Facebook, it seems like everyone I know has taken their families to Italy this summer. I traveled to Italy many times to visit my grandparents there when they were still alive, so it’s not the novelty of it that I crave; mostly it’s just the desire to be somewhere summer-like, to be on vacation. I was home from California with my son for five days, and on the sixth day I was on a plane again – unexpectedly – heading back there, this time on my own. I landed in San Francisco late in the evening after the unfamiliar experience of traveling without children (I felt like an impostor, as if I was play-acting the role of solo traveler) and headed straight to my father’s bedside. I spent the night holding his hand. While in California, I learned that I appreciate the people who care for the elderly and the fragile with the same profound gratitude that I appreciate those who cared for my infant daughter in the NICU. I learned that – after years regretting that I had never gone back to school to become a social worker or a nurse, and that now I felt too old to do so – I have no desire anymore to become a social worker or a nurse. I learned that sitting by the bedside of a loved one feels the same, no matter their age. I learned that plans change. And change. Constantly. I spent some time in the apartment my father has lived in for several years, and got lost for a few hours in photo albums of his childhood and my own. It was cathartic, reminding me again that much of my childhood was easy and free, stable and good, filled with so much love. It reminded me that the love I have for my father is built on the unconditional love he has always had for me. I don’t think our essence changes between childhood and old age. I think at our core, in the purest version of ourselves, we are always the same. I could see in a six-year-old version of my father, in his 22-year-old portrait, in the 40-year-old man who carried ten-year-old me on his shoulders, the same person whose hand I held that week. His dark, striking and loving eyes, his serious brow, his warm, sometimes mischievous smile are the same. Walking up to his apartment, I met one of his friends, a woman in her nineties who told me part of her story of survival during World War II. She told me about the concentration camp where her brother had been, the one she had survived, the one where, in her own words, her father’s body was burned. She was beautiful and I felt compelled to touch her soft hair as I told her how sorry I was for all she had suffered, and how thankful I was that I had met her. Afterwards, I went into my father’s apartment and sat in his recliner and cried. I thought about things – literal physical things, the objects we gather and accumulate in a lifetime, some of which get passed on, others that are given away, still others that are lost or taken from us. I thought about a four-bedroom house that had become a studio apartment; and about my own boxes and bins of things gathered like treasures in my own basement. Will somebody one day read the dozens of journals I started keeping when I was ten years old, which have followed me in their boxes all these years? Will my photo albums or digital photos accurately tell the stories of who I was and who I became? Is there such thing as a true story, or are we constantly curating our memories, filtering what and how we want to remember through the lens of each present moment? How was I experiencing my father in that moment in his apartment, in light of where we were now and what still awaited us? Do any of those things matter, or is it only the less tangible that will be remembered – distilled down to that one pure thing: LOVE? That day, everywhere I turned there was music from the 1980s playing. I haven’t been able to escape the pull of my home town in the past month, so it seemed only fitting that the soundtrack following me matched the reality that every corner I turned held a memory. I have a sewn-on patch of a rainbow on the knee of my jeans in that picture of my father carrying me on his shoulders. It reminded me that I always had patches on my pants, sometimes patches over patches. It reminded me of the transparent rainbow sticker I stuck on my bedroom window, which made things rainbow in my room when the sun shined through just right. When I told my father about the photos I had looked through, he remembered the brown and yellow tie he wore as a child in his kindergarten more than 65 years ago. He remembered the name of the school. Heading to his apartment, I passed a man as I crossed the street who smiled hello. 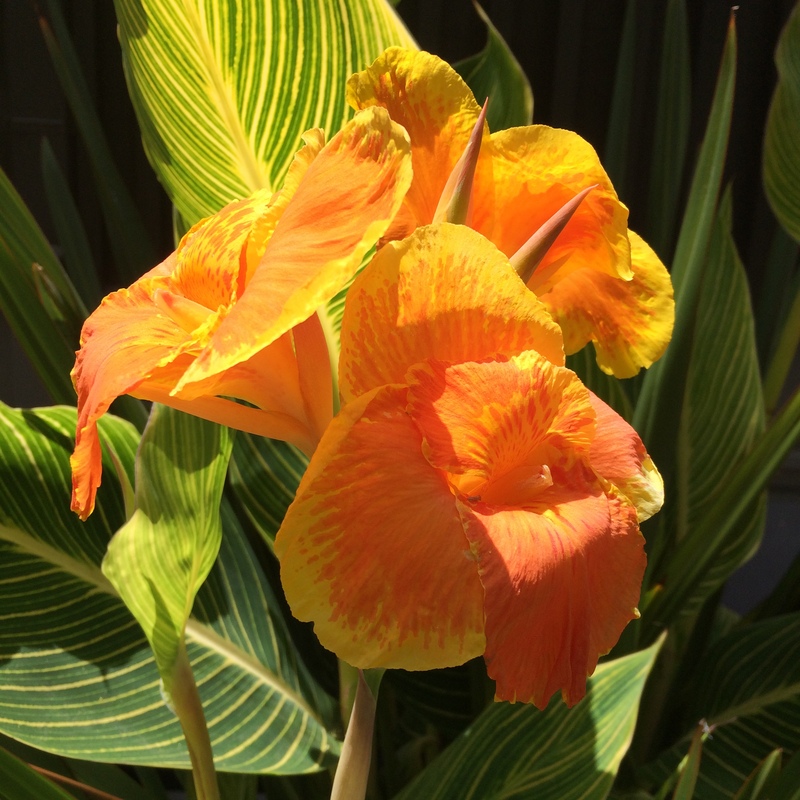 He said to me, “Another day in paradise.” It was warm outside and smelled like flowers, and as I kept walking I spotted a single tropical orange-yellow flower that, indeed, belonged in paradise. The ten days I spent back home again weren’t easy, but they didn’t feel insurmountable. I may not have had much of a summer so far, but I knew I was exactly where I needed to be and that gave me peace. There was work to do there – big work, loving work. I am in awe of the things my sister and I have achieved as a team on behalf of our father, and the love and trust that made it safe and nurturing to have even the most difficult conversations. Once more, I was held and nourished and housed by my closest friends, the ones who know me most deeply, the ones who brought dinner and wine and chocolate at the end of a difficult day. I couldn’t argue with that man as I crossed him in the street – he was right, it was beautiful there on that gorgeous perfect day in that lovely place where I grew up. I’m not sure what paradise is supposed to look like – I imagine the picture is different for everyone – but I wonder if maybe it is meant to contain some of the messy difficult stuff as well as the beautiful things. Maybe, even, the muck is the place where the beauty is able to reveal itself – like the love in my father’s eyes or the softness of his hand. I miss him now that I am so many miles away; I got used to spending each day with him. I am grateful for that time and it comforts me even more now to speak to him on the phone. When I finally returned home again to my family, my daughter hugged me for at least five minutes. She’d been at camp and we hadn’t seen each other for a month and it felt perfect to just hold her and stare into her sparkly eyes. Then I went upstairs, where my son was just falling asleep, and I whispered to ask if he wanted to cuddle. “Yah,” he whispered back, and I held him on the rocker for a long time, my nose nuzzling his curly hair and my hand on his soft cheek. It was the same softness as my father’s hand, and I felt in that moment the way in which there is no separation between my love for my children and my love for my father. And I cried quietly and exhaled all I had held since the beginning of summer, the surmountable-but-still-challenging stuff that called on my very best self to reveal herself. Yes, my love, Mommy stay here. A remarkable and very moving piece of writing, Ga. Thank you.